James Hoff, Useless Landscape No. 37, 2016, copper etching on fiberglass, aluminum, wood, lacquer, 48 x 32''. From the series “Useless Landscapes,” 2016. In his last exhibition here, James Hoff showed how computer viruses could “infect” digital paintings to striking, sensuous effect. For his new show, he considers the banal side of technology with two series addressing how contemporary forms of photography dull our experience of the natural world. “Life Cycle” (all works 2016) comprises rocks painted a black-and-white camo pattern to confuse and escape the flattening, miniaturizing gaze of aerial photography. 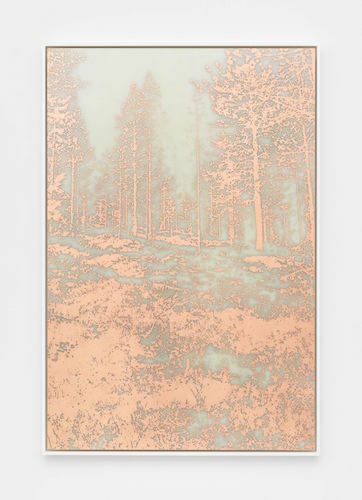 For his second and primary body of work, “Useless Landscapes,” Hoff translated cell phone pictures of upstate New York into copper etchings on fiberglass—material substrates used in circuit boards. Seven narrowly framed images present groups of thin golden trees against gauzy skies. Although each image is different, the variations between them are so slight as to seem unremarkable. Nature, once seemingly vast and majestic, and a hallmark of Romanticism, is here easily captured in the tiniest of mobile lenses. At first glance, “Useless Landscapes” inspires indifference, not exaltation. But don’t be fooled by the suite’s generic, monotonous feel. If you stare at the etchings long enough, their properties shift: The copper starts to look like gold leaf, a material favored in devotional art; and the fiberglass seems thick and springy, like glycerin or fat. Current research indicates that forests possess a manner of intelligence, with trees and fungi communicating via a complex network nicknamed the Wood Wide Web. Maybe our circuit boards and nature snaps (edited, uploaded, and distributed) actually mimic Mother Nature’s divine, organic essence as much as they rob her of it.